CLEAN VEHICLE HISTORY/NO ACCIDENTS REPORTED, BLUETOOTH/HANDS FREE CELL PHONE, 2 SETS OF KEYS, REMAINDER OF FACTORY WARRANTY, and BACKUP CAMERA. 4WD, 8-Way Power Driver's Seat, ABS brakes, Alloy wheels, Compass, Electronic Stability Control, Illuminated entry, Low tire pressure warning, Remote keyless entry, and Traction control. Imagine yourself behind the wheel of this attractive xxxx Ford F-150. 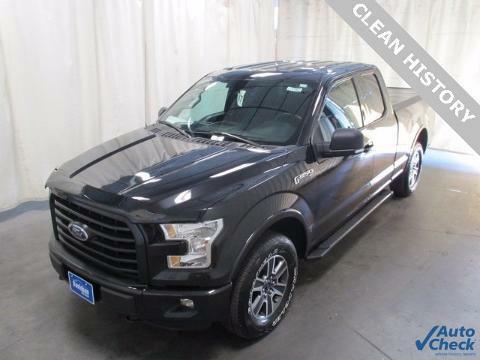 This F-150 is nicely equipped with features such as 2 SETS OF KEYS, 4WD, 8-Way Power Driver's Seat, ABS brakes, Alloy wheels, BACKUP CAMERA, BLUETOOTH/HANDS FREE CELL PHONE, CLEAN VEHICLE HISTORY/NO ACCIDENTS REPORTED, Compass, Electronic Stability Control, Illuminated entry, Low tire pressure warning, REMAINDER OF FACTORY WARRANTY, Remote keyless entry, and Traction control. Happily hauls passengers to and from work and home again.